Made exclusively from Moresca variety olives hand-harvested from mid-October to mid-November in the Noto area of southeastern Sicily. This mild intensity oil has aromas of artichoke and green almonds with a subtle bitter finish. For generations the Cutrera family has been dedicating their lives to the cultivation of olive trees and olive oil production, a profession carried on for decades with passion and love that binds the family to its land. 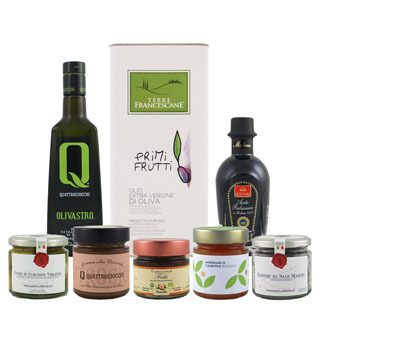 The company's origins date back more than a century ago to 1906 when the Cutrera family first began to cultivate and care for their olive trees in Chiaramonte Gulfi, a small town in south-eastern Sicily. In 1979, Giovanni Cutrera, the head of the family, founded their very first mill the help of his wife, Mary. Over the years Giovanni's children, Maria, Giusy and Salvatore joined their Dad on his farm, and in 1999, decided to open a second mill. The Cutrera family pays diligent attention to each stage of olive oil production: harvesting the olives by hand to minimize damage, transporting the olives to the mill within 6 hours and cold-extracting the oil with scrupulous attention. By maintaining a balance between tradition and innovation, Frantoi Cutrera continues the legacy that the farm's members have been putting into practice for over a century. A beautifully aromatic oil produced by a small family estate in Puglia.